Emotional intelligence has a direct impact on the level of happiness we experience in our life and vice-versa. Happiness is but one example of our emotions. Through understanding and getting in touch with our own emotions, we are better able to communicate more openly with others and have deeper, more meaningful connections. This improves the wellbeing of others and our selves. There has been so much on-going research and debate regarding the definition of our emotional spectrum over the ages. In 300BC Aristotle identified the following emotions: anger; mildness; love; enmity (hate); fear; confidence; shame/shamelessness; benevolence; pity, indignation, envy, emulation and contempt. In 1872 Charles Darwin was the first to write that humans express emotions by their facial expressions (“The Expression of the Emotions in Man and Animals”). He concluded that emotions could be universally recognized based on the facial expressions regardless of language or culture. Paul Ekman, an American psychologist in 1972, also studied emotions and facial expressions. He identified 6 basic emotions; happiness, sadness, fear, anger, surprise and disgust. In 2014, University of Glasgow, in their study, concluded that there are only four basic emotions: anger, fear, surprise, and disgust. Robert Plutchik, another prominent American psychologist, concluded in the 1980’s that there are eight; fear (afraid); anger (rage); sadness (sorrow, grief, depression) joy (happy, glad), disgust (wrong or nasty), trust (acceptance), surprise (unexpected). There seems to be a lack of consensus and differing viewpoints. Perhaps this is because we have limited emotional literacy. We lack the appropriate lexicon to talk about both the range and intensity of our emotions. Our body senses emotions, but it is our mind that puts the words into expressing the feelings. Language and emotion are controlled by different parts of the brain. Our intellectual logical brain (left hemisphere) controls language whereas our emotions are controlled through our limbic system. Specifically it is the amygdala that is considered the emotional centre of our brains, which is linked to our nervous system. This is perhaps why we have difficulty communicating our emotions through words, but our body language communicates on our behalf – loudly. Our body has the ability through our amygdala to speak and communicate our emotions across the cultural divide, as noted by Darwin. Lacking the lexicon for emotional language – our need to express how we feel has resulted in the use of colour to help us describe our mood. For example, we say we feel blue if we are feeling sad. Seeing red is used to describe anger. Mood rings have also emerged as translators of our emotional state to onlookers. Regardless of the modality used to express emotions, cultivating an awareness of our feelings is important, supporting both our mental and physical wellness. We need to be able to identify the full spectrum of our emotions and push ourselves to accept how we feel and work our way through emotional turmoil. Our positive emotions (e.g. appreciation, love, amusement, joy, hope, gratitude) are subtle and have a lower energy intensity level than our negative emotions (e.g. anger, contempt, depression, anxiety, overwhelmed, scattered). Negative emotions have negative effects on our lives. They have the power to drain our energy, negatively impact who we are (our character) and our relationships. Conversely our subtle positive emotions actually re-energize us. They help to open up our heart space, make us more optimistic and open-minded as well. The objective is to gain mastery over our emotions to avoid the negative effect that negative emotions can play on our life and relationships, hijacking our overall wellbeing. We can learn to tune up the dial on our positive emotions in order that we can tap into them more often. Luckily, to do this we have many choices. We can seek the professional help of therapists, counsellors or psychologists or take heart and embark on our own journey with the countless self-help tools available on this subject. 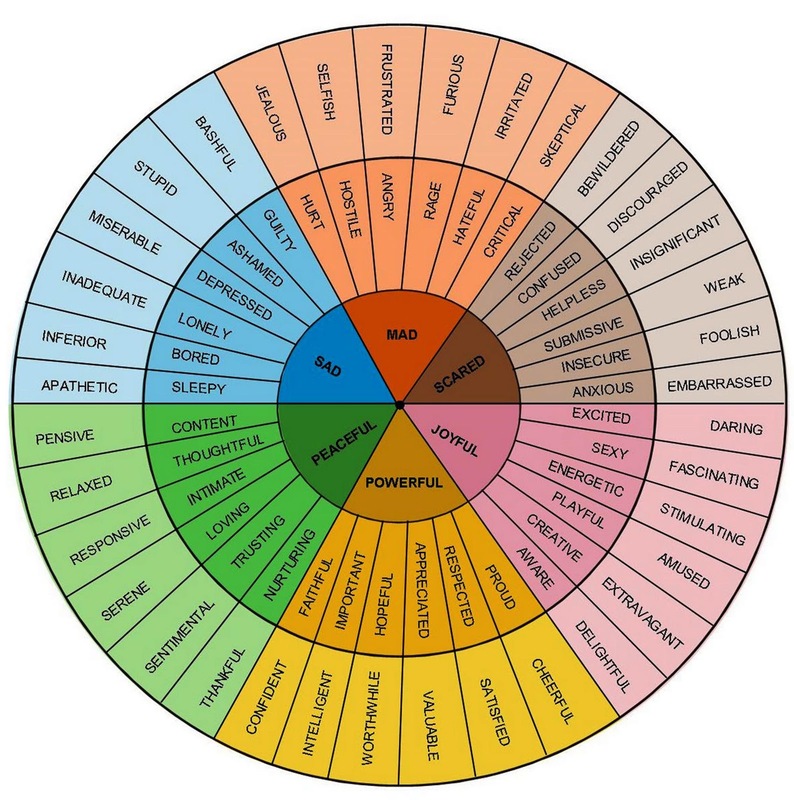 What emotions/sensations are you feeling? Pay attention to simple and complex emotions, (i.e. anger, fear, joy, love, shame, anxiety, boredom, doubt, confusion). Your body will be your best guide. Emotions carry a physiological aspect to them that affects how your body feels. Learn to tune into that. Listen to what you body is communicating to you. Different emotions carry different physical sensation within our bodies. It is important to make sure to not jump to conclusions or make assumptions about your feelings. Notice what positive and negative emotions you are experiencing. Overall do you spend more time in a positive emotional state or a negative one? The goal is to learn to acknowledge and accept all your both positive and negative emotions. We can’t change or enhance what we don’t acknowledge. 2. Track how many times you experience a particular emotion and make notes about the context and triggers. Who were you with? What where the circumstances? Knowing these details will be helpful to gain insights for you to manage and understand your emotions and help resolve the issue. When we know what triggers our negative emotions it arms us with the information we need to support us in making a shift to a more positive state of being. It helps pinpoint situations we need to be better prepared for and to be able to anticipate when we will need emotional support. 3. Reach out to a positive support network that will help you to process your negative emotions. It is ok to share your emotions, to ask for and to get help. The act of connecting to others, talking about and sharing your feelings in a safe environment diffuse our negative emotions and re-enforce our positive ones. Sometimes a hug or a compassionate ear to listen to us goes a long way to rebalancing our on-edge feelings. Sharing happy feelings with others, makes them last longer and they are also contagious so spread them around! Being part of a supportive group or having someone we trust be there for us helps us gain a different perspective as we work through our feelings. 4. Take action through release activities such as writing, journaling, listening to music, hobbies, art and crafts, exercise. The endorphins that come from engaging in doing the things we love rebalance our negative emotional energy. This helps us to calm down, to process and transition out of our negative feelings. Identify what types of activities work best for you to help you process your emotions. Real emotional intelligence comes from embracing the full range of our emotions, both the positive and the negative. Emotions have the power to alter our mind and our body. This is why it is important to learn to harness the energy from our positive emotions and to diffuse and unravel the negative emotions. We must learn not to run from our feelings or numb them with food, drugs, alcohol or other negative self-sabotaging behaviours. It is important not to deny our emotions but to lean into them head on and learn to be comfortable in the messiness of all our emotional states, especially the ones that make us the most uncomfortable. They have the most to teach us about ourselves.